Cucumbers are staples in the average American diet, with large cucumbers typically eaten raw and small cucumbers pickled for long-term storage. Even though pickles are made from cucumber, they differ slightly from raw cucumber with respect to their nutrient content. Pickles generally offer more vitamins and fiber than cucumber but also contain sugar or sodium that lowers their nutritional value. 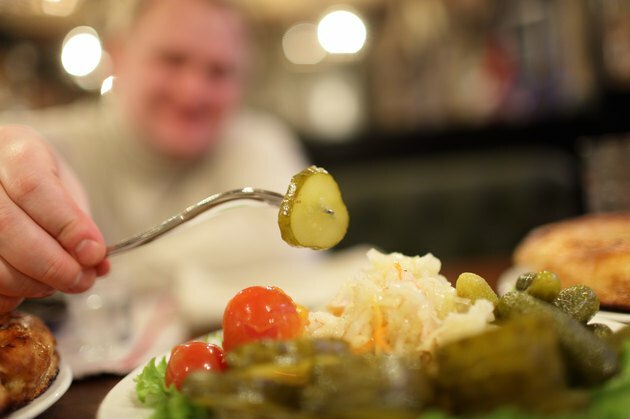 Cucumbers and dill pickles are both low in calories -- a cup of sliced cucumber contains 16 calories, while an equivalent serving of dill pickles contains 19. Sweet pickles are higher in calories, at 139 calories per cup because of their sugar content. Reaching for either cucumbers or pickles boosts your fiber intake. This fiber helps speed the movement of food through your digestive tract, combating constipation, and also helps reduce the level of cholesterol in your bloodstream. A 1-cup serving of sliced cucumber provides 0.5 grams of fiber, while dill pickles offer 1.7 grams of fiber per cup and sweet pickles provide 1.5 grams of fiber. Pickles offer more vitamin K per serving than cucumber. Your body uses vitamin K to activate enzymes responsible for cell growth and development, as well as bone and cartilage health. It also plays a central role in blood coagulation, which protects against blood loss. A 1-cup serving of sweet pickles contains 72.1 micrograms of vitamin K -- 58 percent of the recommended daily vitamin K intake for men and 80 percent for women. An equivalent serving of sliced cucumber provides 17.1 micrograms of vitamin K, while a cup of dill pickles offers 60.4 micrograms. Reach for pickles over cucumber as a source of vitamin A. Sweet pickles, in particular, come loaded with vitamin A. Each cup provides 1,169 international units of vitamin A, which is 39 percent of the daily vitamin A needs for men and 50 percent for women. A cup of sliced dill pickles offers 284 international units of vitamin A, while cucumbers contain 109 international units per cup. The vitamin A abundant in pickles aids in the development of new blood cells, regulates thyroid gland function and supports healthy vision. Cucumbers offer major health advantages over pickles because they're naturally low in sugar and sodium. Each cup of sliced cucumber contains just 1.7 grams of naturally occurring sugar and 2 milligrams of sodium -- less than 1 percent of your daily sodium limit. Dill pickles, on the other hand, contain a whopping 1,356 milligrams of sodium per serving, or 59 percent of your daily limit. A a result, you should limit your dill pickle intake, or you risk the high blood pressure and heart disease associated with a high-sodium diet. Sweet pickles are also high in sodium, at 699 milligrams per cup, and also contain 28 grams of sugar per serving. This sugar offers no nutritional value but boosts your calorie intake and contributes to tooth decay. What Are the Benefits of Sweet Gherkin Pickles?